← People choose to live on quiet streets – so why is it so hard to close residential streets to through traffic? There was a typical August ‘silly season’ story last week – the idea of women-only train carriages, prompted by some comments from a Labour leadership candidate that were seized on and used to generate ‘news’ at a typically quiet time of the year for the media. This is a thought-provoking point; it implies that people who are in favour of separating cycling from motor traffic (at least on busier roads) should also be in favour of separating women from men on trains (if women want to be separated). But I don’t think the analogy quite stands up. ‘Harassment’ is of course one reason why separation of modes makes sense. Walking on footways greatly reduces any harassment you might receive from drivers. So, with an equivalent separation of cycling from driving, harassment from drivers will diminish in the same way. 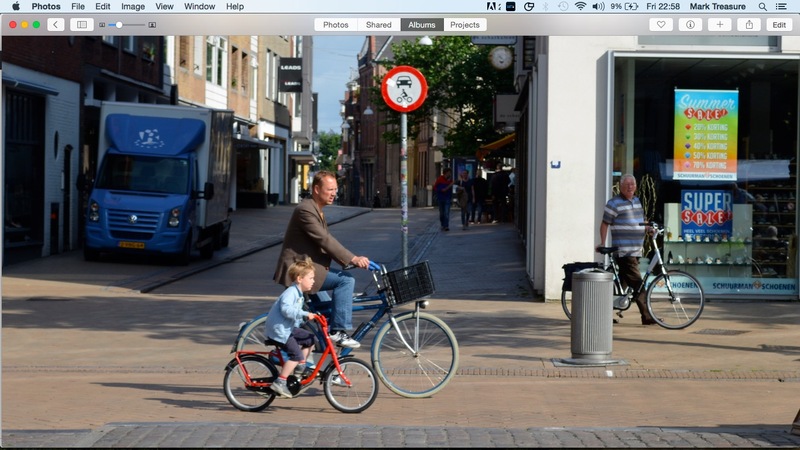 These people in the Dutch city of Zwolle can’t be harassed or intimidated by the drivers in the background. But, with train passengers, I suspect most people don’t think women and men should be separated on trains, because the behaviour that is causing the problem should be addressed in the first place. Men should not harass women; if they do, they should be dealt with, rather than providing a separate (and allegedly safe) space for women. But harassment is not the only reason why separation of the kind shown in the photograph above is provided. Even if we could stop drivers harassing people cycling, separation is still vitally important. We can see why by entering an alternate reality, one where ‘train separation’ is being argued for. But this is an alternate reality designed to resemble the situation on British roads. Let us imagine a situation in which a good number of people in train carriages are in the habit of… throwing and catching bricks. Not all, but a sizeable proportion. You could say, it’s what the British do, on trains. (A bizarre situation, but bear with me). The vast majority of people throwing and catching these bricks are doing so with regard for other people. They’re doing it carefully, and trying their best to ensure their bricks don’t hit other people, be they brick-throwers, or non-brick-throwers. But of course a tiny minority will throw their bricks recklessly. These are the anti-social minority, who don’t really care about other people, and are just lobbing their bricks, willy-nilly, without thought for others. Let us imagine Britain has clamped down on this behaviour, over a period of decades. There are stiff penalties for reckless and anti-social brick throwing; repeat offenders are banned from trains. This policy has been a success for a long time. Dangerous brick-throwing is almost entirely eliminated. The only people throwing bricks on trains are doing so carefully. You will almost certainly never encounter a reckless brick-thrower on a train. Only considerate, thoughtful ones. Despite this success, let us now suppose that people have lobbied – successfully – for train carriages where you won’t encounter brick-throwers. Would you choose to carry on sitting in the carriages with brick-throwing, or would you now opt to sit in these new carriages? We might go further and even imagine that all brick throwing in train carriages will – at some point in the near future – only be carried out by robots, highly advanced robots, who will never make a mistake with their brick-throwing, and will never hit a fellow passenger. You would be perfectly safe to sit in one of these carriages. Again – would you choose to sit in this brick-throwing carriage? Or would you instead opt for the carriage without brick-throwing? The answer to both these questions is surely quite obvious. Faced with a choice between a environment in which potentially dangerous objects are occasionally coming close to you, and an environment in which these hazards are absent, nobody would opt for the former environment – even if those objects are being thrown by human beings who are carefully considering your safety, or by perfect robots. This is why separating cycling from motor traffic is important. While bad behaviour and harassment by drivers is undoubtedly an issue, the bigger problem is that cycling in motor traffic is de facto needlessly stressful, regardless of how well or badly motor vehicles are being driven around you. The experience of cycling in motor traffic may not strictly correspond to sitting in a train carriage where bricks are occasionally being thrown – benignly, and competently – but the reasons why people might want to avoid such a train carriage correspond closely to the reasons people want to avoid cycling with motor traffic. It’s the knowledge that you might come to harm; the visceral sensation, rational or irrational, that your safety lies in the hands of other people. It’s the uncertainty and stress of having to negotiate your way through environments where heavy objects are travelling at different speeds, and angles. These problems might be ameliorated by perfect behaviour, but they will still remain to a large extent, even if motor cars were driven by robots. It’s why we don’t stand close to the platform edge when a train is arriving, even if it might be perfectly safe to do so – the human body instinctively flinches away from heavy objects that are travelling at greater speed, and that have the potential to injure you. We also want some leeway of our own to engage in less than perfect behaviour. It’s stressful having to maintain constant vigilance, and ‘correct’ technique. We’d like to be able to look around at our surroundings; to pay a little less attention to ensuring that we don’t come to grief. To lower our guard. 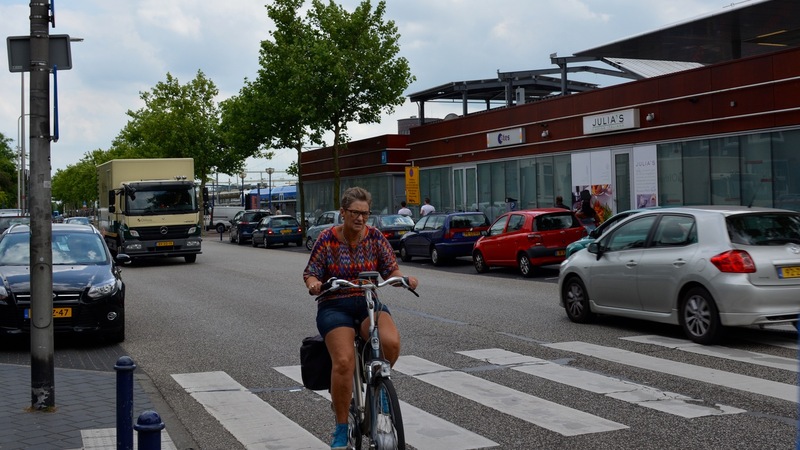 The Dutch cycling environment (when it is done right, of course – the Dutch still have problems, and still make mistakes) removes these kinds of stress from everyday trips. It makes ordinary journeys a relaxing and painless experience, free from concern or worry, from door to door. This mother was happy to let her young child speed off ahead – because the environment is unthreatening. This is what I enjoy so much about cycling in the Netherlands, wherever I go, be it countryside, suburbs, or city centre – it’s the total relaxation, the complete lack of stress. The removal of through-traffic from streets that are ‘shared’ makes them equally relaxing. There are exceptions, of course. What might actually be relatively comfortable environments, by British standards – low speed roads, with quite low traffic levels – leap out jarringly from the smooth, comfortable background experience. The road in front of Zwolle station. Not remarkable by British standards – perhaps even relatively pleasant – but jarringly uncomfortable. Nobody was misbehaving, or driving badly, on the road in the picture above, but cycling along it felt so much more unpleasant than the rest of my journey that day. The uncertainty of worrying about parked vehicles potentially moving in and out; whether drivers were going to turn across your path into side roads; whether the cars, buses or lorries behind you were going to get too close, or attempt to overtake inappropriately. The ‘concern load’ was so much higher here, I simply wasn’t able to enjoy myself. But this is pretty much the everyday experience of cycling in urban areas in Britain. 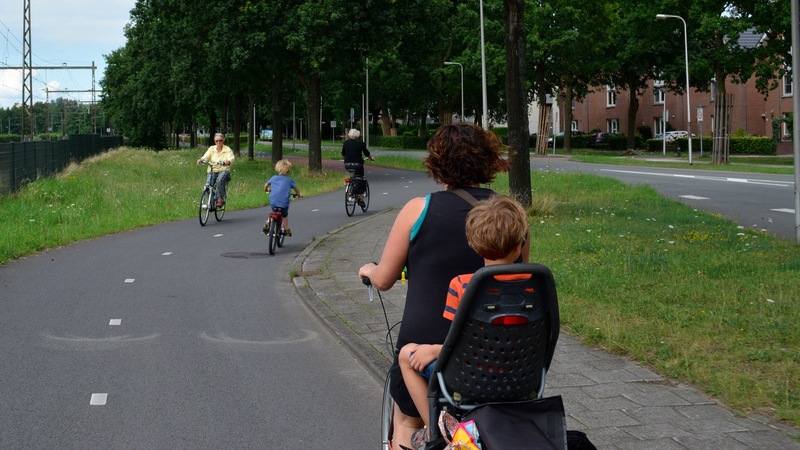 by Dutch standards you will be overwhelmed with a feeling of thorough unsafety when [cycling] on the roads. And this is from someone who is used to cycling; a person who cycles every day in the Netherlands. People like me – reasonably fit, experienced, male, middle-aged – can adapt to these environments, put up with them, and find ways to survive in them. 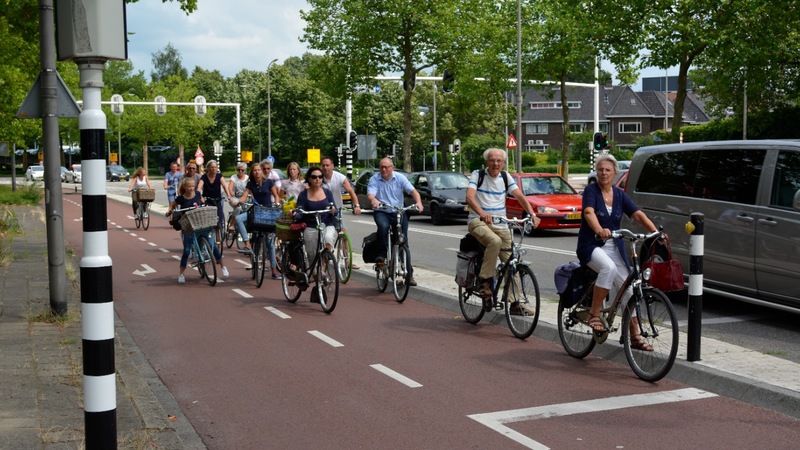 People not cycling already simply won’t cycle in these environments, at all. That’s why cycling levels are so pitifully low in Britain. Mass cycling depends on low-stress environments; streets and roads that invite cycling, and make it as comfortable and enjoyable as possible. This entry was posted in Subjective safety, The Netherlands. Bookmark the permalink. PS link since WordPress turned it into a video ! Making things worse, most of the bricks coming close are thrown from behind. They have got a special roaring sound, so you hear them approaching from behind but of course you can’t see them. Only when they have missed you – and most of the bricks really do so – you’ll see them flying past. For me, as a German, it’s really astonishing to see how decline of car-industry influences cyclist’s world. In US and GB, origins and not long ago strongholds of vehicular cycling, even the MAMILs (middle aged man in lycra), regarded as social base of VC, have turned their mind. In Germany government, car-lobby, political partys incuding the Greens and nearly all cycling campaigners have adopted VC. VC is traffic law. Bicycles are regarded as vehicles (“Fahrzeuge”) and cyclists are forced to use the carriageway. Protected bicycle tracks are torn down – with applause from cycling campaigners. They pretend improving “conspicuity” of cyclists inreases the chance of being missed by the bricks. [quote]The ‘concern load’ was so much higher here, I simply wasn’t able to enjoy myself. But this is pretty much the everyday experience of cycling in urban areas in Britain. Coming from the Netherlands, and having my first experience of cycling in a non-cycling environment (apart from the Netherlands my only cycling experience upto now was in some average German town) this Summer, I could not agree with you more. Cycling in (in my case) the Czech Republic, I did not have a feeling that I was in grave danger all the time. My safety, both objective and subjective, was lower than in the Netherlands but did not get to problematic levels. But the stress of having to think of each and every car – and there were many – What will the driver do? What should I do? Has he seen me? Will I be safe? – that’s what took away much of the pleasure that cycling under better circumstances can have.